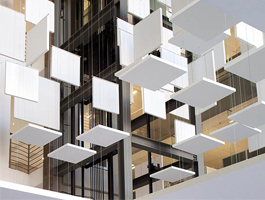 Traditional suspended ceilings are a tried and true solution. But when design dreams and structural realities demand a creative alternative, specialty acoustic products offer freedom and flexibility. 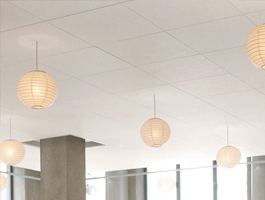 From Ecophon® Solo™ clouds and baffles to Focus™ direct-to-deck panels and Akusto™ One SQ wall panels, CertainTeed will help you specify the right ceiling for your open space – no grid required. 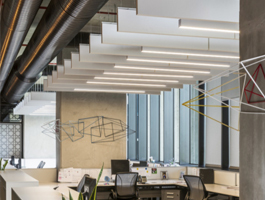 The designers of the new office for science and tech company EMD Performance Materials set out to create a space that feels airy and aspirational while remaining acoustically sound. Watch the video and read the to learn how a last-minute spec change to CertainTeed impacted their design, schedule and budget. Explore the open space design of EMD Performance Materials’ new Philadelphia headquarters. When a ceiling isn’t just a ceiling, our specialty acoustic products offer the design freedom to create something stunning. Learn how to address noise issues in existing spaces without disrupting occupants or the operating budget. 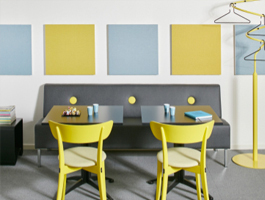 Receive the latest insights on acoustics, design solutions, case studies and more. For expert consultation on your project, a customer service representative can help answer questions on ceiling solutions to meet your project goals. Experience the quality construction and finish of our specialty acoustic products first-hand.